Last fall, Ben & Jerry's and New Belgium teamed up to create a Salted Caramel Brownie Brown Ale. Because that first experiment went so well, they're teaming up again -- makes sense, as the hugely popular companies both make serious, umm, dough. This time they're brewing a beer with a flavor profile from one of Ben & Jerry's most popular flavors of all time: Chocolate Chip Cookie Dough. 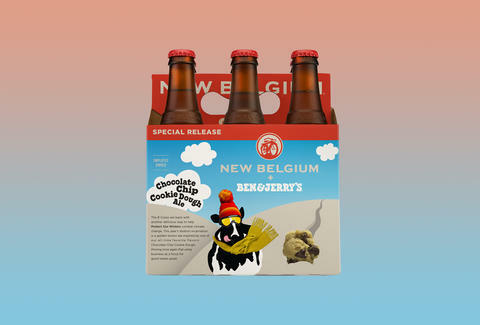 Sometime this fall, New Belgium will release a six-pack of Chocolate Chip Cookie Dough Ale, obviously based on B&J's chocolate chip cookie dough flavor that's objectively the eighth-best flavor in the company's scoop shops. The companies also guarantee that $50,000 of the proceeds will go towards climate change awareness group Protect Our Winters. When you see a six-pack of the Cookie Dough Ale on shelves in the coming months, you should buy it -- last year, I was always on the lookout for the Salted Caramel Brownie Brown Ale at my local beer shop and could never find it. May you have better luck. Just don't bake it. Lee Breslouer is a senior writer for Thrillist, and hopes he finds this beer on shelves. Follow him to ice cream brews: @LeeBreslouer.